If you already hold a RYA Yachtmaster Offshore certificate of competence, you can add an endorsement to it for Ocean work. This is especially useful for those wishing to take command of vessels on ocean passages and is required by many insurance companies. 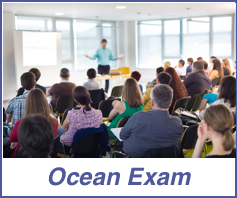 The exam is an oral test (and written if you have not completed a RYA Ocean shorebased course) of your knowledge of ocean passage making including planning, navigation, worldwide meteorology, crew management, yacht preparation, maintenance and repairs. You will also be questioned on astro navigation sights taken at sea during an ocean passage. The exam is the same for motor and sailing vessels. To qualify for the exam, you must have made an ocean passage as skipper or mate of watch. You must have been fully involved in the planning of the passage, including selection of the route, the navigational plan, checking the material condition of the yacht and her equipment, storing spare gear, water and victuals and organising the watch-keeping routine. During the passage a minimum non-stop distance of 600 miles must have been run by the log, the yacht must have been at sea continuously for at least 96 hours and the yacht must have been more than 50 miles from land while sailing a distance of at least 200 miles. All qualifying sea time must be within 10 years prior to the exam.